Even if you intend to drop major change on the V-6 F-Type, make sure you sample the V-8's thrilling active-exhaust soundtrack. Shy of an AMG or an Aston Martin, there's nothing quite like it in autodom. The 2015 Jaguar F-Type piles on even more sportscar credibility with a ravishing Coupe R edition. Jaguar has its first true sports car in at least a generation with the F-Type. 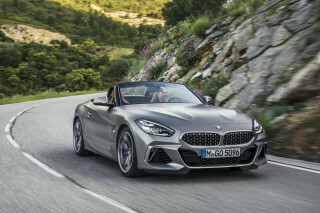 It returns for the 2015 model year, with the roadster gaining a new hardtop coupe companion that impresses us even more, with performance that outshines its sibling and nearly outshines its pedigree. The F-Type effectively replaces the Jaguar XK grand touring coupe and convertible, which have their final pass at shoppers in the 2015 model year. The F-Type may call back to classic Jaguar sportscars with its rear-drive, two-seat layout, but it manages to steer well clear of cliche and of purely retro hooks. The design is pure contemporary, bare and essential, with just a cue here and there drawn from the well--the round taillamps, the fender vents. There's enough Corvette and Maserati influence to go around, especially at the front end, but it sums itself up best in its curvaceous shoulders and at the rear end--which to our eyes, forms more beautifully on the hardtop. The cockpit's a more intensely focused sportscar environment, too. The gauges tuck deeply into binnacles, while the passenger gets a grab handle--a wordless confirmation of its true mission as much as the orange-tinted start button and shift paddles. There's no wood trim to be found, but carbon fiber and red leather are on the can-have list. Ancillary information is displayed on a big LCD screen; climate controls have prominent positions on the stack as rotary knobs with push functions for seat heating. All grand-touring bias gets swept away as you climb the F-Type ladder, from standard supercharged V-6 to extraordinary supercharged V-8. The six-cylinders are 3.0-liter units, one tuned to 340 horsepower, another to 380-hp tune. The 0-60 mph estimates for these range from 5.1 seconds and 4.8 seconds, respectively, and top speeds are limited to 161 mph and 171 mph. The roadster's V-8 is a 5.0-liter unit, with 495 horsepower, pegged at a 0-60 mph time of 4.2 seconds, with a top speed limited to 186 mph. The Coupe R's distinctive V-8 nets 550 hp, and the quickest 0-60 mph time of 4.0 seconds. An eight-speed automatic is the only transmission for now, but adaptive controls and shift paddles make it an eager, quick-responding companion to either engine. Behind the wheel, the F-Type lives up to its sportscar intent, though it still carries a fair amount of weight, which filters off some ultimate steering feel in all models, even the otherwise otherworldly Coupe R. It's crafted from aluminum like the XK, but it's shorter, though still bigger than the Boxster and Cayman, its primary competition, and at 3,500 pounds and up, heavier. In the end, the aluminum is less about weight loss than weight balance. The F-Type's basic setup is quick and nimble enough, but it's in the higher-output six and the eight-cylinders, with adaptive dampers, where it truly intrudes on sportscar territory. It lacks the finer precision of a Boxster or Cayman until you opt into the track-able Coupe R--at which point the rorty, yaw-happy F-Type goes fully in on grip and responsiveness. We think it's more entertaining to drive than just about anything in its class, except the Cayman S and possibly, the Corvette Stingray Z51. Functionally, the F-Type suffers for being a sportscar, but any more than those worthy competitors. The roadster's trunk is tiny; the coupe has a better rear cargo area that might hold two golf bags if pressed. The cabin is suitably roomy for two adults, so long as their legs aren't 99th-percentile. On roadsters, the convertible top is power-operated and folds in such a way that no tonneau cover is needed. It also lowers or rises into place in 12 seconds, at speeds of up to 30 mph. Both it and the coupe are happily quiet on the go, until you trigger their adrenalin-stirring levels of overrun. Finally, luxury features haven't been left off the sportscar's menu just to save a few ounces--not if the well-heeled buyer wants them. The F-Type's power sport seats have manual fore/aft adjustments to save weight, but upgraded "Performance" seats are an option, as is full power adjustment. Audio systems come from Meridian, with either 10 or 12 speakers, and either 380 or 770 watts of power. The base 340-hp supercharged V-6 coupe costs $65,925; the roadster is about $4,000 more. The 380-hp supercharged six cars start from around $78,000. The V-8-powered F-Type Coupe R just barely slides in below $100,000. It likes to slide. And so will you, if that number fits inside your wallet. The Jaguar F-Type gives credit to its past, but makes bank on a sharply detailed silhouette all its own. Look unfamiliar? The F-Type hasn't abandoned Jaguar's storied past, not entirely. The shape only hints at the heritage of the E-Type and the XK. It's entirely new, and it's almost perfectly penned to yank your retinas in its general direction. It's a shorter car than the more languid XK coupe and roadster, so the outline of the F-Type isn't quite as elegant. That's also why it works so well: it erases that memory, and transliterates just enough Jaguar cues into its new design language. The relatively tall front end is lightened by a large grille that's not the usual oval. The gills cut into its fascia anthropomorphically. The LED-underlined headlamps give the nose of the F-Type a sharp, incisive quality with more than a little bit of Maserati or Corvette flair, while the round taillamps call back perfectly to the classic E-Type. 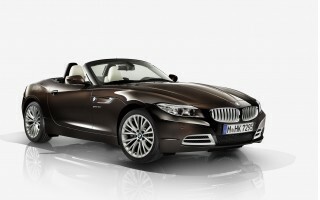 It flows fantastically, we think especially as a coupe, where the flowing roofline sets it apart smartly. The hard top could have abbreviated the shape in ungainly ways, but it hasn't--it's only amplified those powerlifter haunches. The best detail: there are no door handles to mar the F-Type's flow. Instead they pop out of the doors at an angle with a push of the key fob (or a finger). Inside, the F-Type is more focused and more intentionally operational than the XK before it. There's no wood trim, but carbon fiber's available--and that nugget restates the intent wordlessly. A large, central LCD screen displays most of the information, backed up with an informative screen between the analog gauges in the instrument panel. Three multi-purpose knobs below the screen handle climate control and seat heating. Descending alongside the screen and center stack controls is an extra passenger grab handle--a plain cue to the F-Type's sporting nature. Other subtle cues also mark out the differences in the driver's space: slightly different trim around the instrument panel, orange-accented start/shift/and sport mode switchgear on some models; and an optional flat-bottom steering wheel. A wide range of design packages is available, with colored stitching, seats, and more. Awesome V-8 muscle and a relatively absorbent ride make the F-Type one of our favorite sportscar cruisers. The Jaguar F-Type falls in line with the classic sportscar formula, while it skips some of the harsher penalties sportscars can extract. It's a lighter-weight two-seat with rear-wheel drive, with sharp reflexes are sharp, high levels of grip, and impeccable balance. 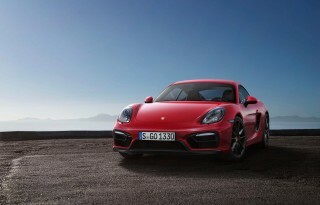 At the same time, it's not quite as hard-edged as some of the alternatives--it's a bit better balanced for passenger comfort than something like a more fluidly capable Porsche Cayman. Each of the F-Type's three engines has forced induction. There's a supercharged V-8, as well as a pair of new supercharged V-6s--set apart by twin inboard exhausts, while the V-8 has quad exhausts, mounted outboard. You don't have to be an apologist to be happy with either of the supercharged V-6s. The six-cylinders are 3.0-liter units; one is tuned to 340 horsepower and 332 pound-feet of torque, and it's shared with other Jaguar products, including the XJ and XF sedans. In 380-hp tune, it's a distinct version held aside strictly for the F-Type S roadster and coupe. The 0-60 mph estimates for these models range from 5.1 seconds and 4.8 seconds, and top speeds are limited to 161 mph and 171 mph. The V-8 in the S roadster is an evolution of the current 5.0-liter unit, with 495 horsepower, and 460 pound-feet of torque. It's pegged at a 0-60 mph time of 4.2 seconds, with a top speed limited to 186 mph. 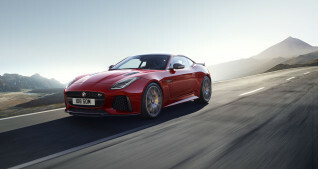 The ultimate F-Type Coupe R gets the same 5.0-liter supercharged V-8, but it's uprated to 550 horsepower, with a 0-60 mph time of 4.0 seconds, and a top speed of 186 mph. While the base engine is strong, it's a touch less potent in the lower half of the rpm range than we'd like. The F-Type S's 380 horsepower fills in that gap, while maintaining the base model's responsive feel. The V8 S is incredible fun--accelerating at full power produces smiles not just from the brisk acceleration but from the sound of the big engine as it roars up the gears and crackles back down them. The 550-horsepower Coupe R? It's breathtaking, even without the tap of its active-exhaust system. Active exhaust is standard on the two higher-performance models, and optional on the 340-hp F-Type. An eight-speed automatic transmission with rev matching and paddle-shift controls is the only transmission available--for now, Jaguar officials hint. Unlike the latest models from the marque, the F-Type doesn't sport a rotary shift control--it has a conventional shift lever that, if anything, preserves the packaging for a true manual transmission. The Quickshift automatic changes gears quickly, but in our experience with the car, there's a delay between the driver's request of the shift (whether by paddle or lever) that takes some getting used to. Left to its own devices, the transmission picks, and even holds, the right gear admirably, however the F-Type is driven--though especially with the F-Type Coupe R, it's a delight to paddle down and up, at the very least to unleash that copious overrun. All powertrains have direct injection and stop/start systems. The more powerful V-6 gets a mechanical limited-slip differential; the V-8 gets an electronically controlled version for maximum traction. The V6 S, V8 S and Coupe R have launch-control modes for fault-free acceleration runs. The usual electronics are there, but as a supporting act: a sport mode will quicken throttle response, weight up the steering, speed up shifts, and delay the onset of stability control. The F-Type is crafted from aluminum, and its weight savings of a few hundred pounds versus some competitive cars are meaningful. However, the aluminum body structure pays off more in optimal weight balance than it does in weight loss. The relative leanness amplifies its superb drivetrains, but also lets those drivetrains extract even more from its aluminum suspension. It's even better with the Coupe, which gets a specific roof beam for strength. Its body is said to be 80 percent stiffer--a real accomplishment, given the already stout glued-and-riveted aluminum body. The front and rear setup is independent, with an option for adaptive dampers. Power steering is by electric motor, and it's in good tune, quick to cut in but typically devoid of intimate communication as an old-fashioned hydraulic setup would be. Braking comes via standard 13.9-inch front and 12.8-inch rear brakes; mid-range F-Types get 15-inch rotors in front, while the V-8 model has 14.8-inch rear rotors. Aerodynamic aids include an active rear spoiler that deploys automatically, and a front air splitter. 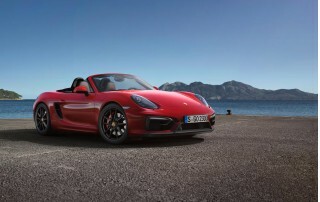 The basic roadster has admirable manners, with a slightly softer setup than Porsche's entries in this niche. It's a wide car, and that bit of compromise between ride quality and 9/10ths composure--and its substantial width--can discourage using up all of its available traction on some narrow roads. Step it up a notch, and the adaptive suspension on the higher-performance models offers driver-configurable control, as a whole or system by system--you're be able to choose a faster throttle response while keeping light steering weight and a comfort-oriented ride, for example. You'll also be able to measure g-forces through a track-time recorder that displays your performance on the LCD screen. It's all the encouragement we've needed to flog the F-Type briskly. The Coupe R is the best shoe of the F-Type family, no doubt. The springs are a few percent stiffer at each corner, and the fast-acting adaptive shocks are a lot less permissive. As a result, the Coupe R simply does a better job of shearing off corners and gathering itself more quickly than any of the F-Type roadsters we've driven. There's no weight difference, V-8 to V-8, but the revised body structure and retuned dampers resolve some of the minor handling qualms we've had with the convertible, like a mild side-to-side pistoning. The Coupe R is flatter, and happier, and in its element on a wide, freshly paved track with a few corners carbon-copied from our secret corner of Appalachia. A half-dozen miles are all takes to understand what's going on with the Coupe R: big blitzes of full-on power, slashed and burned with big stabs of optionally fitted carbon-ceramic brakes, some leaning on the Coupe R's electronic torque vectoring to tighten a line here and there. The fast throttle wants to be in the game all the time; the stability control's sport mode is mapped out to be playfully loose with the tail. It'll give you more yaw angle than you can use, before it reins in the Coupe R from situations where it might otherwise rotate with Olympic speed. In other words, it's riotous fun. The trunk is tiny on roadsters, but the F-Type Coupe's reasonably accommodating--and both are lovingly trimmed. Like the XK, the F-Type's body structure is made from aluminum. 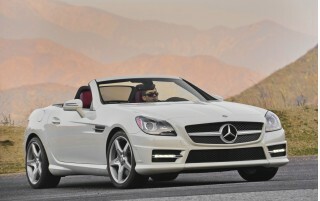 It's large for the cars it's priced against in the U.S.--Boxster, Z4, SLK. It's even close to the 911. And while it's 176 inches long, with a 103.2-inch wheelbase, it's also a wide-tracker at 64.1 inches at the rear. Unlike some other sportscars that masquerade as more practical machines--with a pair of nubby "seats" in back--the Jaguar F-Type is honest about its selfishness. Especially as a convertible, it's tight on cargo space, and intimate even then for just two passengers. It's fantastic in that way--no crying babies, no coach-class accommodations. Only six-foot-plus passengers will notice any shortcomings in the F-Type's cabin. Those taller folks will notice the F-Type's slim headroom, and the shorter leg room assigned to the passenger side. That set aside, the F-Type is very comfortable; the sporty power seats look great, and do a good job of gripping occupants through tightly drawn turns. The performance seats double down on bolstering, and are maybe a little less cozy for long-distance trips. With the roadster's top up, all is quiet and calm. Lower the top, and wind intrusion is minimal until you begin to approach triple-digit speeds. The coupe's primary source of noise is the one you want to hear: the one from ahead of the firewall. What you won't spend a lot of time doing in any F-Type, Coupe or roadster, is packing. The roadster's trunk is minimal, even by sports car standards--the tiny Mazda MX-5 Miata offers more space. The 7 cubic feet in the convertible's trunk are arranged in a thin layer, making it difficult to fit even medium-sized bags. The coupe fares somewhat better: two golf bags might nestle in longways behind the front seats. We managed to fit a roll-on bag and two smaller camera bags and to wholly consume the cargo hold of 11.7 cubic feet. As for materials, fit, and finish, the F-Type is absolutely on par with any other Jaguar product we've driven in recent years, which is to say: it's very well built. Beautifully stitched leather melds cleanly with robust-feeling plastic and metal trim, doors shut firmly and solidly, and the controls all seem meaty and durable in hand. There's no crash data yet for the F-Type, but a big rearview camera and other safety tech give us confidence. The Jaguar F-Type offers up a body structure designed for speed and safety. It's bonded and riveted from aluminum panels, an aerospace technology that helps it shave overall curb weight. It also comes standard with the usual airbags and stability control, and in the case of the roadster, rollover protection behind the seats. However, neither the Insurance Institute for Highway Safety (IIHS) or the National Highway Traffic Safety Administration (NHTSA) have performed any crash tests on the Jaguar F-Type, which is typical for cars of its price and volume class. On the options list, the F-Type offers up a rearview camera with a large in-cabin display; blind-spot monitors; reverse and front parking sensors; and active torque vectoring delivered via the anti-lock braking system, on some models. We'll update this section if and when crash-test data becomes available. Meridian sound, performance seats, track-driving modes--virtually everything we'd want in a sportscar is here. In the case of the F-Type's balance between svelte sports car minimalism and high-tech luxury, the balance tips to the side of comfort. Standard equipment includes power features, leather upholstery, Bluetooth connectivity, and cruise control. On the roadster, the convertible top is power-operated, and raises or lowers itself in 12 seconds at speeds of up to 30 mph. Power sport seats have manual fore/aft adjustments to save weight, but upgraded "Performance" seats are available, as is full power adjustment--including power lumbar and side bolsters that can greatly enhance the driver's security in the seat. Audio systems come from Meridian, with either 10 or 12 speakers, and either 380 or 770 watts of power. Packages of options vary by powertrain and body style, but the major features included in them is common to both the roadster and coupe. The feature set can include adaptive cruise control, blind-spot monitors, and a rearview camera; keyless entry, 14-way power seats, and heated seats; a premium leather interior with the performance sport seats; a black-out trim package for the grille, vents, and splitters; a carbon-fiber accent package; and a red-leather interior package. F-Type Coupes have the lowest base price in the lineup, at $65,925, with base roadsters carrying about a $5,000 premium. The F-Type S Coupe starts at $77,925, roadsters $81,925. 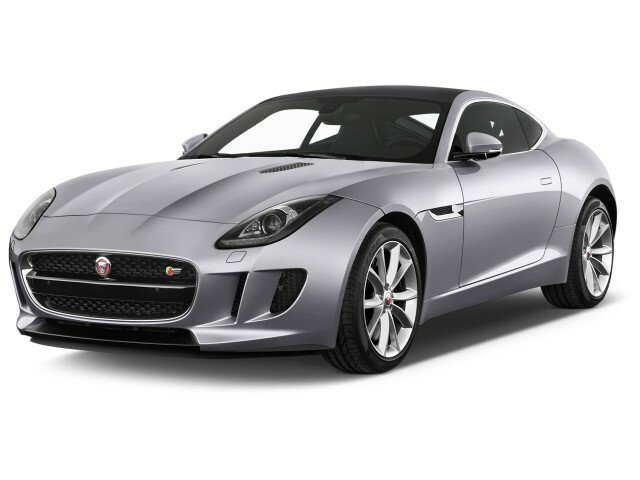 The F-Type V8 S roadster is priced from $92,925, while the F-Type R Coupe begins at $99,925. The most personalized and high-performance models, ranging as high as $110,000 with a full equipment set, offer a uniquely Jaguar sensibility, making the most of the F-Type's balance between civility and speed. The EPA looks somewhat kindly on the V-6 F-Types, but the V-8 is what it is. If you're driving a Jaguar F-Type with a V-6 engine, you're experiencing fuel economy that's well in line with other powerful sportscars like the Porsche 911. The stock F-Type coupe and roadster turn in EPA-certified gas mileage of 20 miles per gallon city, 28 mpg highway, and 23 mpg combined. 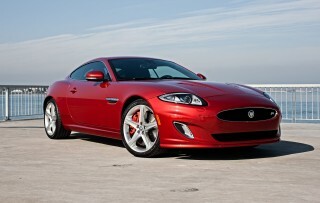 Even the uprated 380-hp version of the F-Type, the V6 S, earns ratings of 19/27 mpg, or 22 mpg combined. That's a loss of just one mile per gallon on each test, in spite of the additional 40 hp on tap. The powerhouse of the F-Type roadster lineup is the V8 S, rated at 495 horsepower from its supercharged V-8; the analogue in the F-Type Coupe R belts out 550 hp. Accordingly, the V-8s are the least efficient in the family, scoring just 16/23 mpg and 18 mpg combined. They're not super-thirsty for their performance level, and some of that is due to stop/start technology built into every F-Type, V-6 or V-8. Looking for a different year of the Jaguar F-Type?